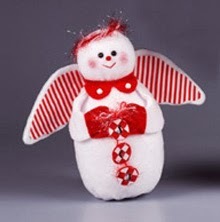 Who wouldn't find this red and white striped holiday angel a joy to create? She's so sweet and she'll watch over all your loved ones this Christmas season. Create for a friend or as a lovely addition to your handmade Christmas decor. Red/white fabrics: striped, 6" x 12"; checked, 2" x 4"
Wax serrated knife with candle stub or paraffin. Cut thin slices from opposite ends of foam egg and one side of foam ball. Glue flat side of ball to narrow end of egg for head. Clean stray bits of foam from work surface before cutting fabrics. Cut pattern pieces as indicated. For wings, cut two from white felt on outline; cut one from red/white striped fabric on dashed line. In addition, cut 10" x 11" rectangle from fleece and three 1" circles from red/white checked fabric, paying attention to position of checks. Glue fabric circles to remaining red felt; trim felt just outside fabric edges. Evenly wrap fleece rectangle cut in Step 2 around foam head/body, overlapping fleece edges at back; glue fleece edges to secure. Gather fleece evenly at top and bottom, pulling tight; glue fleece to foam to secure. Trim excess fabric. Wrap and glue collar tightly around neck to shape head. Glue buttons to collar. Refer to photo to create face. Use scissors point to make two holes for eyes in foam, 3/8" apart. Glue beads in place, pushing firmly into holes. Glue pom pom nose to face. Use fingertip to apply blush to cheeks. Use three strands red floss to stitch small, v-shaped mouth. Bring embroidery needle from bottom of head, through foam ball, to face. Stitch mouth through fleece only. To finish, take floss back through foam ball to bottom of head; knot and clip thread. Glue sleeve and mitten pieces together in pairs. Refer to sleeve pattern for mitten placement. Glue sleeves to sides of body under head. Glue felt wings together; center and glue striped wing on top. Glue center of wings to back of head. Adhere "JOY" letter stickers to fabric/felt circles. Tie small bow with tails from red and white fibers. Glue red fibers around edge of each "JOY" circle. Glue circles to bow tails. Glue bow to mittens. Twist fibers together and wrap around top of head for halo; glue to secure.